Milking, day 2. And a new name. 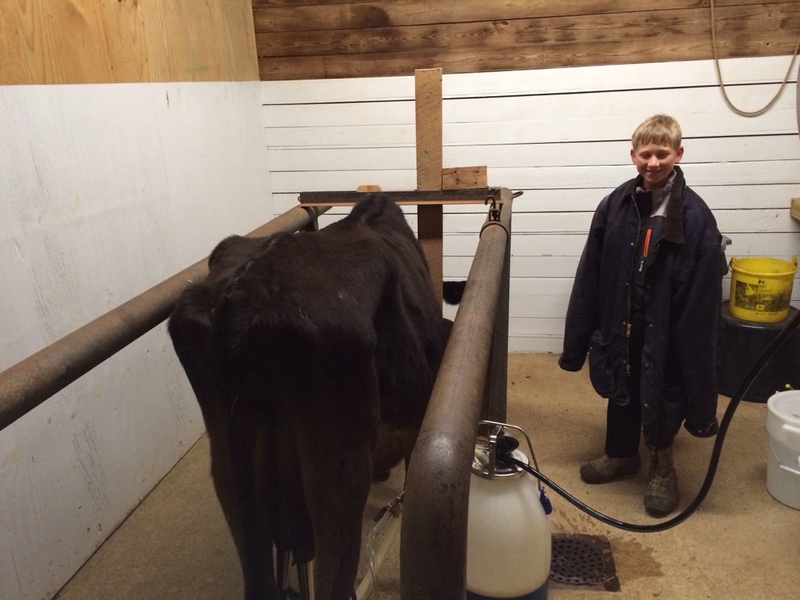 Today we had our second day of milking the new cow. Unlike yesterday where she was in the barn, this morning we had her out in the pasture with the other cows. You never know how that’s going to go but she came right up to is and was very interested in the food bucket. After a few munches I was able to walk her by halter to the milk parlor where she only balked for a few seconds before going in to be milked. 2 1/2 gallons of sweet Jersey milk later and she was done. Pictured here you see Spork out this morning at 6am. He is part of the morning crew but what made this even more impressive is that he and a bunch of of the rest of us went out to see The Hobbit last night and didn’t get to bed till after 11pm. Not a complaint from the boy this morning. He jumped right on his chores. The girls, not so much. So we made an executive decision this morning and the new milk cow will be named Dottie. I don’t know if we need to have a renaming ceremony like you do with a boat. After the issues we had with Maggie, I think its sounding like a better and better idea.